Another Wednesday, another lesson. This week, we’re looking at working with professionals. I touched on this on Monday, but this time, we’re looking at it from a viewpoint that’s not complaining. This time, is should actually be helpful. Monday is just my complain day, remember. As I mentioned before, I’ve been working with an editor. I was going to email her by this weekend if I hadn’t heard from her. I did actually get an email just as I submitted my last post. It wasn’t to give me a completed version, but it was to tell me that it was almost done. She was supposed to get back to me yesterday, but didn’t. So, I’ll give her another week. It’s important to keep in contact with the professional you’re working with. I’ve found that out. While I trust my editor, I want to make sure she’s doing what she needs to be doing with my book. I also found it’s important to keep in contact with the professional you’re working with because of my publicist. She’s amazing. Seriously. She has gotten in contact with many reviewers and had gotten them to accept reviewing my book! I’m honestly amazed at how well this is going… I didn’t talk to her for nearly a month (not intentionally, just didn’t know what to say and didn’t want to bug her), and I start up a conversation once again and find out that there’s a lot of reviewers out there that want to read it! Also, I found out from her that my editor sent her a well-written pitch for my book that they’ll use to contact more reviewers. I’m not surprised that it was well-written, but yay anyway! I’m finding out more and more that it’s important to keep in contact with these professionals. Yes, coming across a review for your book an be a pleasant surprise, but what if your publicist (if you have one) set it up for you? Don’t you want to be able to thank them? You also need to keep in touch with your editor. I know, you don’t want to bother them and slow them down in their work. I totally get that, believe me. But, guess what? If you want to know how far along they are in your work, ask them. It’s okay to ask, believe it or not. I know there are other professionals involved in the mix, but those are the two that I’m working with currently. Just keep in mind, if you want to know what the progress is, keep in close contact with the professionals. 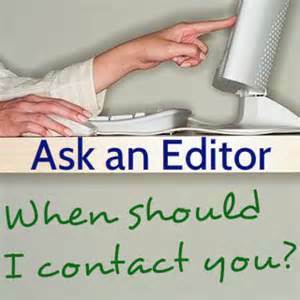 So, if you haven’t kept in contact with the editor and you haven’t heard from your editor in a few weeks, you might want to see how he or she is doing. Ready? Go.